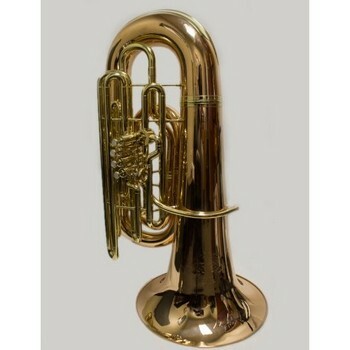 This used Kanstul 5433 Model "The Grand" BBb tuba is in excellent cosmetic and playing condition. It has had one owner, and was purchased in 2014. This tuba includes a SKB TSA compliant case. The Kanstul Model 5433 certainly lives up to its name “Grand.” Using Kanstul’s proprietory “York” live metal formula, the depth of resonance and nuances in the variation of color it can achieve can only be described as “incredible”. Used exclusively by John Van Houten in the recording studios of Hollywood, its sound can be heard on such dynamic movies as Rouge One: A Star Wars Story, Star Trek Beyond and Into the Darkness, Jurassic World, Mission: Impossible – Rogue Nation, Men in Black 3, Dawn of the Planet of the Apes, Inside Out and many upcoming sequels. It is setting new standards for “quality low notes in every octave” in the movie capital of the world—Hollywood. Please note- this item is only available for In Store Pick Up or Local Delivery (within roughly 30 miles of 98683). Please call us at 360-694-7134 or 541-653-9929with any questions.